Samsung unveiled its new Galaxy Tab S2 in July, and at its London Samsung Unpacked eventon 13 August the company revealed that the tablet would be coming to the UK next month, September 2015. But what’s the difference between the new Tab S2 models and the original Galaxy Tab S? 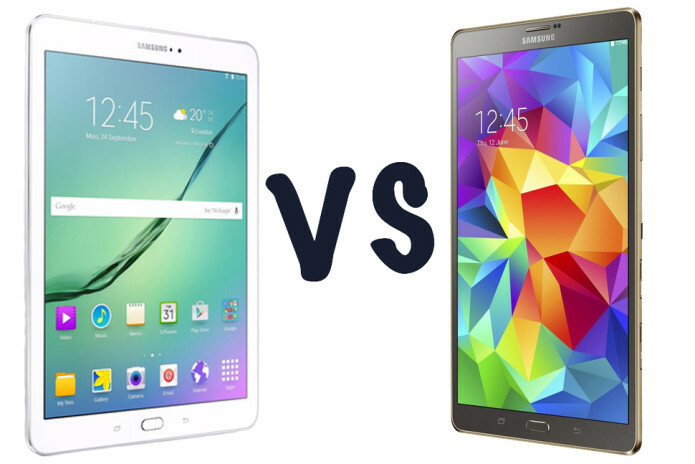 We explore in our Samsung Galaxy Tab S and Galaxy Tab S2 comparison, which includes both sizes of each tablet. Let’s talk about the pricing and availability of the original Galaxy Tab S. While the Galaxy Tab S used to cost £399 and £329, both have had price cuts, with £50 off the 10.5in variation at £349, and £70 off the 8.4in variation, at £249 (mainly thanks to the announcement of the second-gen tablet). The Galaxy Tab S is available to buy now directly from Samsung, or viaAmazon. The upcoming Samsung Galaxy Tab S2 will be available to purchase in the UK from 4 September 2015, same day as the recently announced Samsung Galaxy S6 Edge Plus. With regards to UK pricing, there’s no word yet from Samsung. However, with this being said, the original Samsung Galaxy Tab S cost £399 (10.5in) and £329 (8.4in) respectively at launch, so we’re assuming that the Tab S2 will be somewhere around that mark. If this is true, it brings the Samsung Galaxy Tab S2 in line (at least price wise) with the iPad Air 2 and the iPad mini 3, which costs £399 and £319 respectively. We’ll update this section once Samsung announces the Galaxy Tab S2 pricing, so check back regularly. The Samsung Galaxy Tab S boasts a design similar to that of the Galaxy S5, especially with its plastic textured back plate. However, don’t let the inclusion of plastic put you off the Tab S – the plastic is exclusive to the back plate with slick, premium metal edges and a glass display. The Tab S is a pretty lightweight tablet too, weighing in at only 298g for its 8.4in model, although the 10.5in model weighs 169g more, at 467g, and is available in two colours, ‘dazzling’ white and ‘titanium’ bronze. We were really impressed by how thin and light Samsung’s Tab S models were, so it’s a surprise to find that the new S2 models are even thinner and lighter than before. The Tab S is 6.6mm thick, but the Tab S2 is only 5.6mm and weighs 265g (7.9in model) and 389g (9.7in model). Compared to the iPad Air 2, which is 6.1mm thick and weighs 445g, it’s a pretty impressive design feat and should translate to a more comfortable in-hand experience. The Samsung Galaxy Tab S2 has had a slight change in terms of design, with the most noticeable change being the screen sizes. Whereas the original Tab S offers 8.4in and 10.5in variations, the Tab S2 offers 7.9in and 9.7in variations, which interestingly are the same display measurements as the iPad and iPad mini. Like the Tab S, the Tab S2 offers a plastic back plate with premium-look metal edges and a glass front, although the second-gen tablet is easier on the eye than the original, especially for Apple fans. The resolution of both the 8.4in and 10.5in models of the Tab S is 2560×1600, but that has been reduced with the new models to 2048×1536. That means that the pixel density for the smaller tablet is down to 320 from 359ppi, while the bigger tablet’s pixel density has been reduced to 264 from 280ppi. The screens still use the standard Samsung AMOLED technology for punchy colours, and with all of the Tab S tablets you get the Adaptive Display mode that adjusts the display’s gamma, saturation and sharpness depending on the content to make it easier on the eyes. You might also notice that the logo and camera on the larger model Tab S2 have shifted. On the original tablet they were in the centre at the top of the tablet when you held it landscape, but Samsung has decided to them so that the tablet’s natural orientation is portrait. The Samsung Galaxy Tab S and Tab S2 are, quite interestingly, very similar in terms of features and specs. The Tab S boasts an Exynos 5420 octa-core processor with four 1.9GHz cores and four 1.3GHz cores, with the Mali-T628MP6 handling the graphics. It also boasts an impressive 3GB of RAM, and has both 16 and 32GB storage options – don’t worry if that’s not enough for you, as the Tab S also includes a MicroSD card slot that supports up to 128GB of external storage. So, how does the Tab S2 compare? It too boasts an Exynos octa-core processor, but instead offers a slightly more updated variation, the Exynos 5433 to be precise. Backing that up is a Mali T760MP6 GPU, and 3GB of RAM. Storage options have seen a boost though, with the Tab S2 offering 32 and 64GB variations as standard, with support for up to 128GB of external storage via a MicroSD card slot. This means that the Tab S2 can theoretically offer a whopping 192GB of storage, which is impressive for a tablet. Let’s move on to a more interesting point regarding the batteries in the two devices. The 8.4in Tab S houses a 4900mAh battery, and the 10.5in Tab S houses a 7900mAh battery, which air fairly decent sizes for tablets. With regards to the Tab S2, you’d expect some kind of upgrade in terms of battery power, right? Apparently not, as the 7.9in Tab S2 boasts a 4000mAh battery (900mAh less), and the 9.7in Tab S2 boasts a 5870mAh battery (a whopping 2030mAh less). The Tab S 8.4in could last for around nine hours of video playback, and with varied use it could comfortably last a few days between charges. We’ll update this section with more information on the Tab S2’s battery life once we get it to PC Advisor towers for testing! We’re hoping that even with a smaller battery, the Tab S2 can compete with the battery life of the first generation tablet. All four of the tablets in this comparison feature a fingerprint sensor beneath the physical home button at the bottom of the tablet, though the Tab S2’s fingerprint tech has been improved to require a simple touch (like the Galaxy S6) rather than the swipe required by the older tablet, which can be a bit fiddly to use. There are 4G LTE models available for each of the tablets, too, but they’ll cost you a bit extra to buy and you’ll need to pay for a monthly data contract to make the most of it. Each model has 802.11ac Wi-Fi and GPS, the older models have Bluetooth 4.0 while the new Tab S2 models have Bluetooth 4.1. None of the tablets offer NFC, though. With regards to cameras, there’s not a lot to compare. Why? Because the cameras are pretty much identical, with a 2.1Mp front-facing camera for all your selfie needs, and a rear facing 8Mp camera. There’s one slight difference though; while the original Tab S features an LED flash, the next-generation Tab S2 doesn’t. This would make sense if the Tab S2 was cheaper than its predecessor, but until Samsung announces pricing, we have to sit and wonder why it wasn’t included. We’ve been hands-on with the Tab S2’s camera, and found that it takes fairly decent quality photos, although we did notice that some looked slightly grainy. If you’re the kind of person that likes to record video via a tablet, you’ll be interested to know that the Tab S2 boasts 30fps at 1440p, compared to the 30fps at 1080p offering from the original Tab S.
The original Tab S comes with Android 4.2.2 KitKat pre-installed, but there is an update available to bring it up to Android Lollipop. The Tab S2 comes with Android 5.0 Lollipop out of the box, and we assume that it’ll receive the Android M update once it launches, though this has not yet been confirmed by Samsung. You’ll find that both the Tab S and S2 are overlaid with Samsung’s own TouchWiz interface, and Tab S2 owners will also receive Microsoft Office and 100GB of OneDrive space free for two years, too. All of these tablets offer the Multi-window mode that lets you run two apps side-by-side, which is a really handy feature that we enjoy.